Colorful Family Home in Washington, D.C.
Design 101 teaches that rooms with a visual connection—say, a dining room that peeps into a living room, or a living room and central hallway that engage in a frank face-off—should display colors that relate and work well together. The goal, of course, is to avoid the uncomfortable disconnect of adversarial palettes. 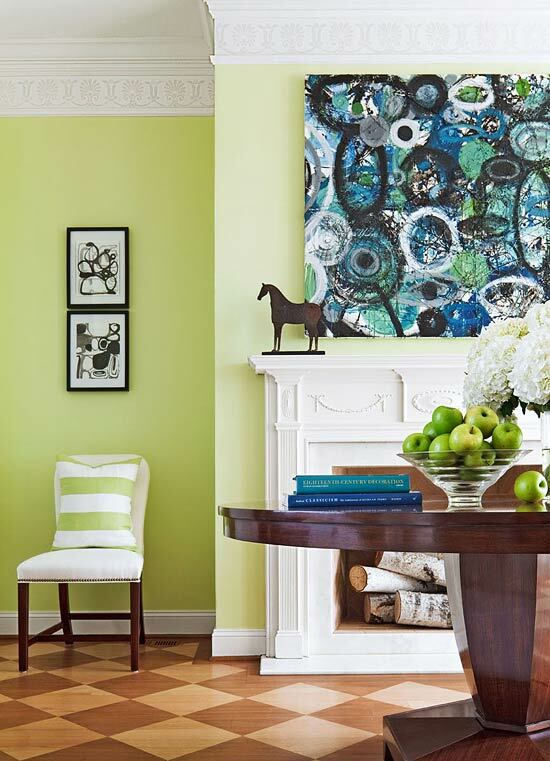 Designer Shazalynn Cavin-Winfrey took color logic a step further when she redecorated the 1890s home of Elizabeth and John Siegel in the Washington, D.C., area. “You want carryover color throughout the entire house, not only in those spaces that share a visual connection,” she says. 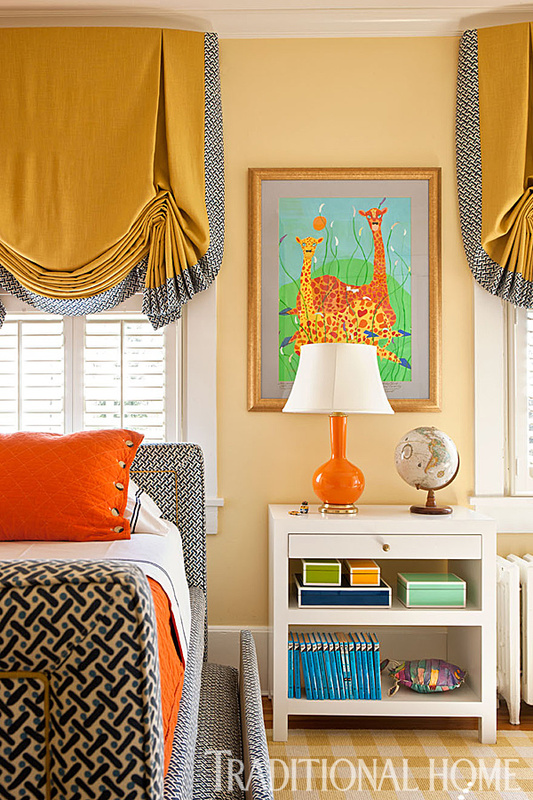 Even children’s bedrooms—though they might be located wings or floors away—should have palettes compatible with those in the main living areas, the designer believes. In a stately home like the Siegels’—replete with majestic columns on the outside and expansive interior spaces—making a new millennium color statement could have presented a challenge. Thankfully, Cavin-Winfrey’s client, Elizabeth, though from good Southern stock, has an open mind, free from thoughts of fainting couches and velvet ropes. 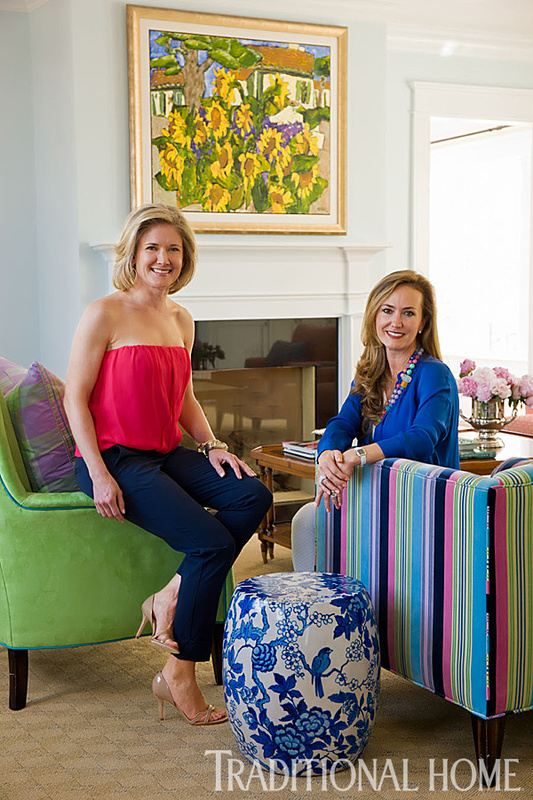 “Elizabeth is originally from Louisiana, and she has a definite flair for color,” says the designer, who first worked on the house years ago when the Siegels bought it. “They have three children, and we wanted to infuse the house with color in different ways for their young family.” This time around, she assisted with some space shifting and an overall redecorating that presents bold color as its cutting edge. 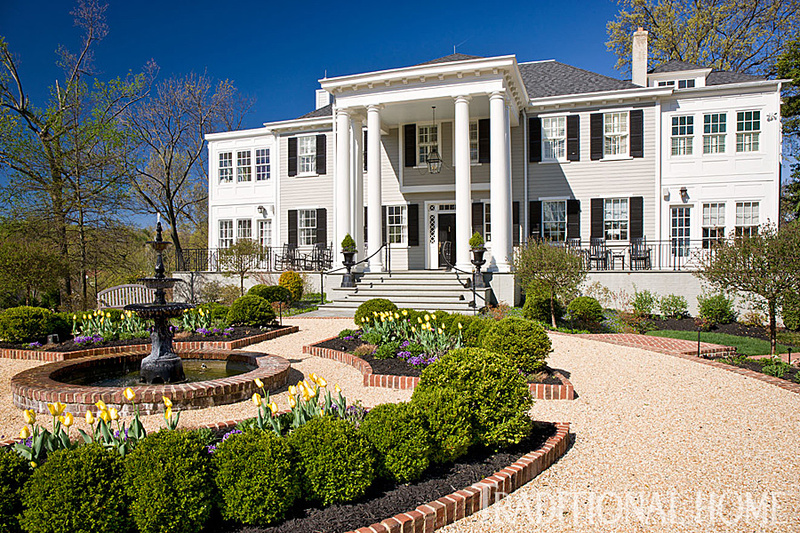 A center fountain and raised planting beds showcase the manicured grounds fronting the late-19th-century house. Interior designer: Shazalynn Cavin-Winfrey, SCW Interiors, 516 N. Washington St., Alexandria, VA 22314; 703/549-2449, scwinteriors.com. 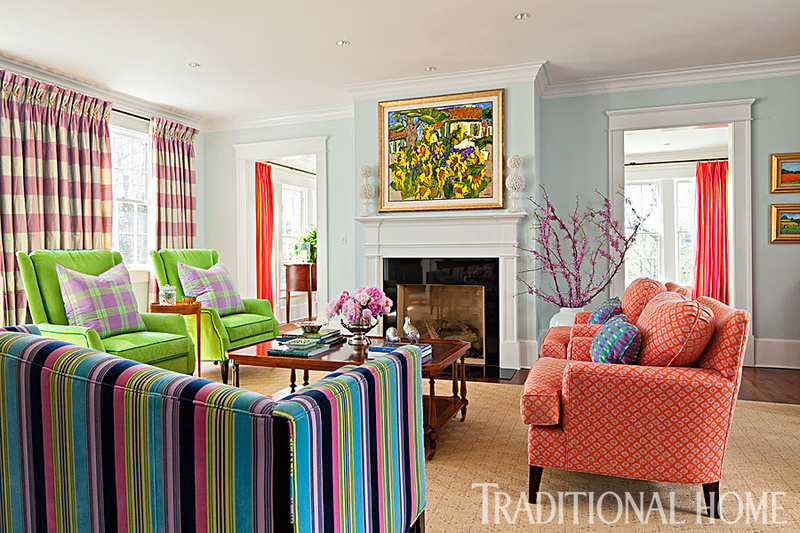 The youthful exuberance of the living room’s brightest hue—lime green on the pair of window-front chairs—is tempered by the nod to tradition in the chairs’ modified wing style. Across the room, orange linen chairs in a patterned weave stand as “a counterpoint. This color is a little less expected than another blue or lavender,” says Cavin-Winfrey, who believed orange was a color worth repeating. She chose a friskier shade for the dining room curtains, which are visible through doorways flanking the living room fireplace, assuring the rooms read as separate but related. The painting above the fireplace is by Claude A. Simard. The silk-taffeta check drapery fabric is from Silk Loom and the side table is an English antique heirloom. The area rug is from Stark. Window treatment fabrication: Donna Wheeler Drapery Designs, 703/971-6603. Wall paint (“Polar Ice” #1660); ceiling paint (“Atrium White”); trim paint (“Decorators White”): Benjamin Moore, benjaminmoore.com. Sofa (private label); coral-colored lounge chairs: SCW Interiors, scwinteriors.com. Sofa fabric (“Cordellina”/Ocean #F1100/01, by Designers Guild); coral-colored drapery in back room (“Francia”/Poppy #F1105/07, by Designers Guild, discontinued): Osborne & Little, designersguild.com. Lounge-chair fabric (by Nina Campbell): discontinued. Fireplace surround (black granite): R. Bratti, rbratti.com. Art over mantel (by Claude A. Simard): Galerie Alan Klinkhoff , klinkhoff.ca. Pair of objects on mantel (discontinued): Made Goods, madegoods.com. Small paintings to right of doorway (by Ruth Russell Williams): owner’s collection. Drapery (Taffeta: Checks/Plaids #1121401): Silk Loom, silkloom.com. Pair of green chairs: SCW Interiors, scwinteriors.com. Chair fabric (“Mezzola Lusso”/Sap #F1453-08, by Designers Guild): Osborne & Little, designersguild.com. Table between chairs (antique): owner’s collection. Cavin-Winfrey employed a couple of design tricks—varying both the textures and color values—to make the bold palette work. “If all of the color values [brightness] were the same, the effect would be boring, almost like a monochromatic room,” she says. Instead, color values range from the brightly colored chairs to the quieter curtains and even more muted walls and flooring. The designer’s textural range spans the nubby linen on the orange chairs, slippery silk on the curtains, soft Ultrasuede on the lime-green chairs, and fuzzy sea grass on the floor. So much textural diversity keeps the palette balanced, as do other techniques. “It’s all about keeping the color values, the scale of the color, and the color proportions in balance. It’s really very mathematical,” Cavin-Winfrey explains. A pair of chairs in front of the window are covered in fabric from Designers Guild and piped in blue. Drapery (#1121401, Taffeta: Checks/Plaids Collection): Silk Loom, silkloom.com. In the family room, Cavin-Winfrey built the design around a comfy and durable dark-blue-and-purple sectional sofa massive enough for the whole family, plus friends. So while the sofa’s palette is forgiving but somber, the fiery orange in the chevron braided wool rug keeps the room upbeat, especially in tandem with the orange leather cocktail table. The blue background of the curtains’ beautiful chinoiserie pattern repeats the blue of the living room walls, bringing the home’s palette full circle. Kravet’s “Tea Blossom” fabric on the draperies continues the pale blue introduced in the living room. Robert Abbey lamps draw the eye with their sculptural shapes in orange. The custom sectional sofa is covered in a hard-working Brunschwig & Fils chenille. The custom ottoman wears orange leather, and the custom-designed rug is from Stark. Wall paint (“Stolen Moments” #477); ceiling paint (“Atrium White”); trim paint (“Linen White” #912): Benjamin Moore, benjaminmoore.com. Drapery (“Teablossom”/Yangtze #TEABLOSSOM.135): Kravet, kravet.com. Orange lamps (by Robert Abbey): available through Lamps Plus, lampsplus.com. Pagodas (SCW private collection); sofas (SCW private label); leather ottoman (SCW private label): SCW Interiors, scwinteriors.com. Art to right of window (family portrait); custom. Sofa fabric (“Bubbles Chenille Texture” in China Blue/Plum #BR-89742.M27): Brunschwig & Fils, brunschwig.com. Orange-patterned pillows (custom); bolster pillows on sofa: discontinued. Multi-colored pillows: Dransfield & Ross, dransfieldandross.biz. X benches: Jonathan Adler, jonathanadler.com. Area rug (custom rope rug): Stark, starkcarpet.com. 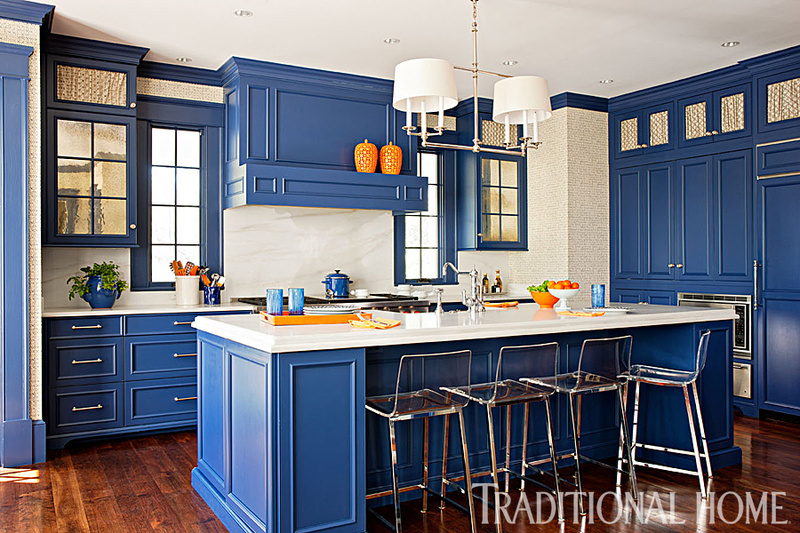 The kitchen boasts one of the home’s most daring color displays, with the millwork painted rich navy blue. “It would’ve been very difficult to keep this huge space from feeling sterile if we’d painted the millwork white,” the designer says. Lucite-and-metal bar stools from CB2 pull up to the island topped in Carrara marble. The range is Wolf. “The barstools are a little edgier and a little unexpected. It’s all about practicality with three kids and all their friends,” the designer says. Cabinetry (custom): Signature Custom Cabinetry, signaturecab.com. Countertop and backsplash (Carrara marble): R. Bratti. rbratti.com. Refrigerator with custom door: KitchenAid, kitchenaid.com. Pendant over island (“Classic Billiard Light” #SL5816): Circa Lighting, circalighting.com. Bar stools (“Vapor”): CB2, cb2.com. 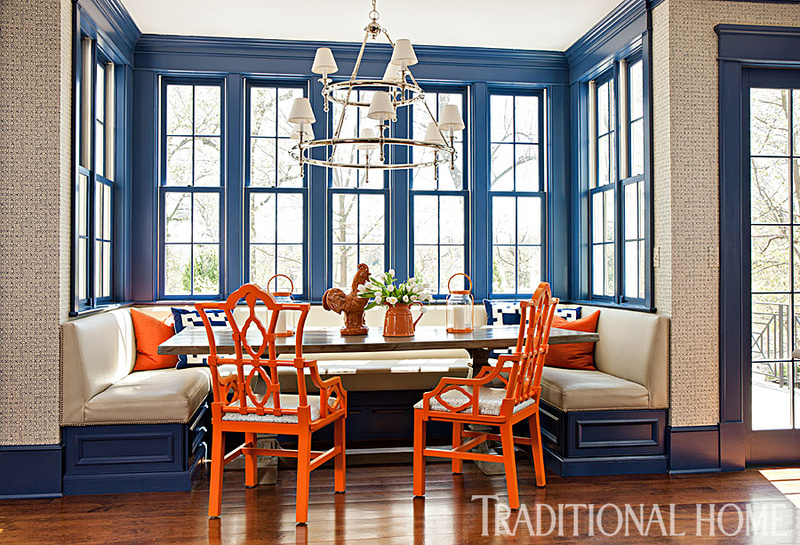 “The dark blue window moldings bring the space inward, so you can cozy into it," says Cavin-Winfrey. "They are very grounding.” The windows also repeat the color of the kitchen cabinets. “If you’re going to take a risk with the cabinets, go all the way!” she advises. Farrow & Ball’s “Drawing Room Blue” on the windows and cabinets grounds the large room. Chinese Chippendale-style chairs sport a custom paint color and China Seas batik fabric. The chandelier is from Circa Lighting. Wallpaper (“Melong Batik” #6450-05WP, by China Seas, colorway discontinued): Quadrille, quadrillefabrics.com. Trim paint (“Drawing Room Blue” #253): Farrow & Ball, farrow-ball.com. Chair-seat fabric (“Melong Batik”/New Navy on Tint #6450-06, by China Seas): Quadrille, quadrillefabrics.com. Chandelier (“Classic Two-Tier Ring Chandelier”/Polished Nickel #SL5813): Circa Lighting, circalighting.com. Blue-and-white pillow (“Painted Greek Key Pillow,” colorway discontinued): Dransfield & Ross, dransfieldandross.biz. A consistent palette doesn’t mean all spaces must evoke the same mood. The small library carries out the color scheme with its light blue walls, but a custom dry-brush glaze creates a depth and patina not found elsewhere. “I kept thinking of a Tiffany blue box,” Cavin-Winfrey says. The dry-brush glaze tamps down the hue for a respite that creates tranquility and quietude. Circa Lighting sconces with natural linen shades are positioned as reading lights, saving floor space. Custom chairs and ottoman are dressed in Hodsoll McKenzie fabric. Wall paint: custom finish with glaze. Ceiling paint (“Atrium White”): Benjamin Moore, benjaminmoore.com. 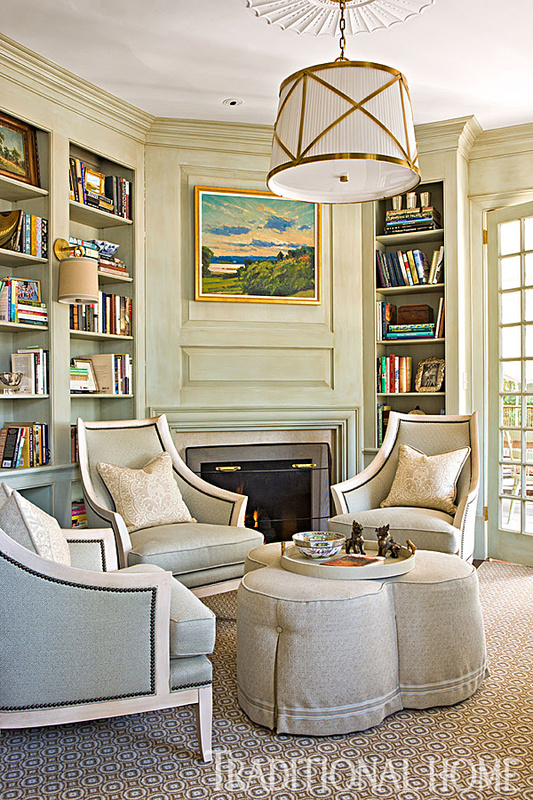 Hanging light (“Grosvenor Large Single Pendant”/Antique Burnished Brass #CHC1483); wall sconce (“French Cuff Sconce”/Soft Brass #BBL2035, by Barbara Barry): Circa Lighting, circalighting.com. Matinee around pendant light: original to house. Sconce shades (natural linen): custom. Shade trim (“Richmond Braid”): Samuel & Sons, samuelandsons.com. Area rug (“Promenade Roundel”/Beige and Blue #800): Patterson, Flynn & Martin, pattersonflynnmartin.com. Chairs (SCW private label); ottoman (SCW private label): SCW Interiors, scwinteriors.com. Chair-and-ottoman fabric (“Maine” #21056-784, by Hodsoll McKenzie): Zimmer + Rohde, zimmer-rohde.com. Pillows on chairs (“Veneto”/Pumice #302202F, Quadrille Collection): Quadrille, quadrillefabrics.com. Ottoman trim (“Cambridge Strie Braid”/Aquamarine): Samuel & Sons, samuelandsons.com. Art over fireplace (by Larry Chappelear): Susan Calloway Fine Arts, callowayart.com. Serenity also reigns in the master suite, which features calming neutrals, but, in fact, captures more vibrant colors, too. 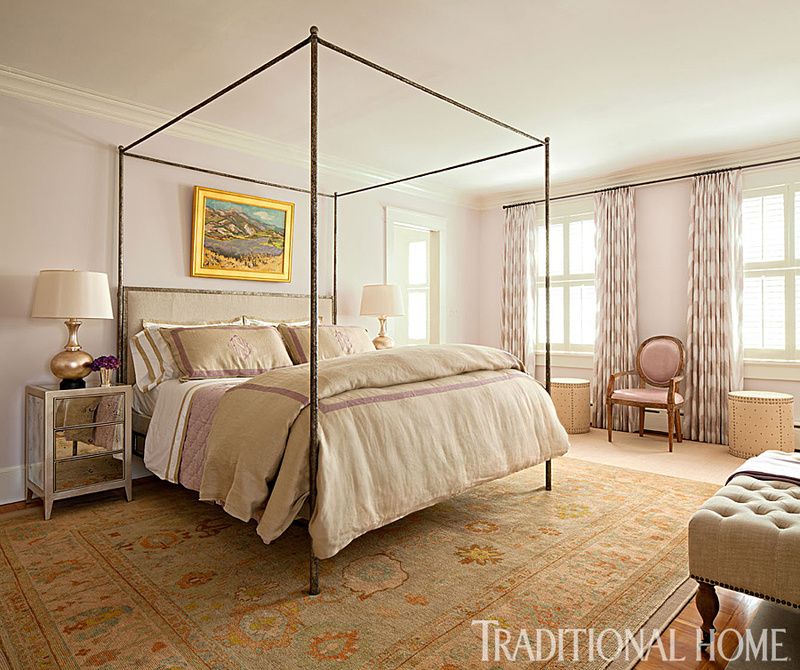 “The gorgeous Oushak rug includes a coral or melon hue and the painting features lavender. It’s a calming space, but it definitely still has energy,” Cavin-Winfrey concludes. With its headboard covered in natural linen, the “Willa” four-poster bed from Oly creates mass in the large room without sacrificing its fine proportions. Lee Industries stools at the windows join a custom chair. The mirrored bedside tables are from Made Goods, and the tufted bench across from the bed is from RH. Wall paint (“Antique Pearl” #2113-70); ceiling paint (“Atrium White”); trim paint (“White Dove” #OC-17): Benjamin Moore, benjaminmoore.com. Drapery (“Marina”/Lilac #11116-03): Cowtan & Tout, cowtan.com. Chair by window (SCW private collection): SCW Interiors, scwinteriors.com. Pair of ottomans by window (“Drum Ottoman” #9203-10): Lee Industries, leeindustries.com. Ottoman fabric (discontinued): Osborne & Little, osborneandlittle.com. Bed (“Willa”); headboard fabric (natural linen): Oly, olystudio.com. Duvet and monogrammed pillows (custom): Legacy Home, legacylinens.com. Bedside tables (“Mia”): Made Goods, madegoods.com. Table lamps; painting behind bed (from antique store): owner’s collection. Area rug: Michaelian & Kohlberg, michaelian.com. Bench (“Tufted Bench”); bench fabric (Belgian linen): Restoration Hardware, rh.com. Striped wallpaper from Harlequin’s Lalika collection balances the bold Walker Zanger floor tiles, whose scale “is a response to the size of the room,” the designer says. Mirrors not only “push the light,” but draw in the capacious room for a cozier feel. They also reflect the double-entry shower stall’s showpiece abstract tilework, which is double-framed in tiles like a piece of art. Wood-Mode cabinets add warmth to the space. Cabinetry (“Essex” door style); finish (“Vintage”): Wood-Mode Fine Custom Cabinetry, wood-mode.com. Hardware: House of Antique Hardware, houseofantiquehardware.com. Hanging lantern (“Morris”): Circa Lighting, circalighting.com. Wallpaper (“Kia” #15606, Lalika Wallpapers from Harlequin): Zoffany, zoffany.com. Flooring (Stone Mosaic, from Studio Moderne Stone by Michael Berman): Walker Zanger, walkerzanger.com. Marble shower tile: Walker Zanger, walkerzanger.com. Settee (SCW private label): SCW Interiors, scwinteriors.com. Settee fabric (“Glazed Linen”/Shale): Robert Allen, robertallendesign.com. Pillows on settee (“Barcelo”): Dransfield & Ross, dransfieldandross.biz. Scalamandré fabric curtains were recycled from another room in this redo. The wall color is aqua “Blue Diamond” from Benjamin Moore. 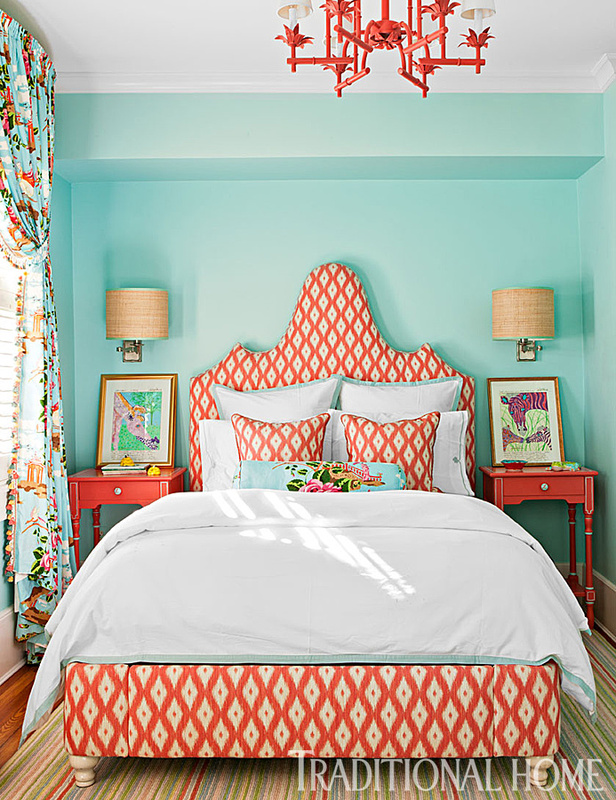 A colorful chandelier matches the Brunschwig & Fils bed upholstery fabric. Bed linens are Serena & Lily. Wall paint (“Blue Diamond” #736); ceiling paint (“Atrium White”): Benjamin Moore, benjaminmoore.com. Chandelier (discontinued): Shades of Light, shadesoflight.com. Drapery and bolster pillow (“China Rose”/Pink and Orange on Blue #16429-003): Scalamandré, scalamandre.com. Drapery trim (“Medea Tassel Fringe”/Coral Pink, Sunflower, Teal #TF1018-4): Schumacher, fschumacher.com. Area rug (“Candy Stripe”): Stark, starkcarpet.com. Bed (SCW private label): SCW Interiors, scwinteriors.com. Bed fabric (“Viceroy Strie”/Coral #BR-89732.634): Brunschwig & Fils, brunschwig.com. Bed linens (“Border Frame Duvet Cover and Shams”/Aqua): Serena & Lily, serenaandlily.com. Sconces (“Carole Swing Arm Wall Lamp” #AH2020, by Alexa Hampton): Circa Lighting, circalighting.com. Sconce shades (custom): Hillary Thomas, hillarythomas.com. Giraffe paintings on bedside tables: by Betsey Fowler, fowlerwildlife.com. A yellow Karastan rug repurposed from the nursery dictated the traditional yellow wall color. The daybed includes a trundle for sleepovers. Wall paint (“Traditional Yellow” #170); ceiling and trim paint (“Atrium White”): Benjamin Moore, benjaminmoore.com. Bed fabric and window-shade trim (“Kells II”/French Blue/Navy on Tint #AC200-09, by Alan Campbell): Quadrille, quadrillefabrics.com. Bed linens (“Italian Hotel Satin Stitch White Sheet Set”/Navy): Restoration Hardware, rh.com. Blanket (“Twin Coverlet”/Orange); pillow sham (“Quilted Sham”/Orange): Utility Canvas, utilitycanvas.com. Throw pillow at back (“Throw Pillow Big Cata”): Roberta Roller Rabbit, robertarollerrabbit.com. Throw pillow at front: Coco Cozy, cococozy.com. Bedside table (“Lacquer Side Table”): Wisteria, wisteria.com. Lamp on bedside table (“Genie Brass and Orange Ceramic Table Lamp,” by Robert Abbey): Lamps Plus, lampsplus.com. Giraffe art: by Betsey Fowler, fowlerwildlife.com. 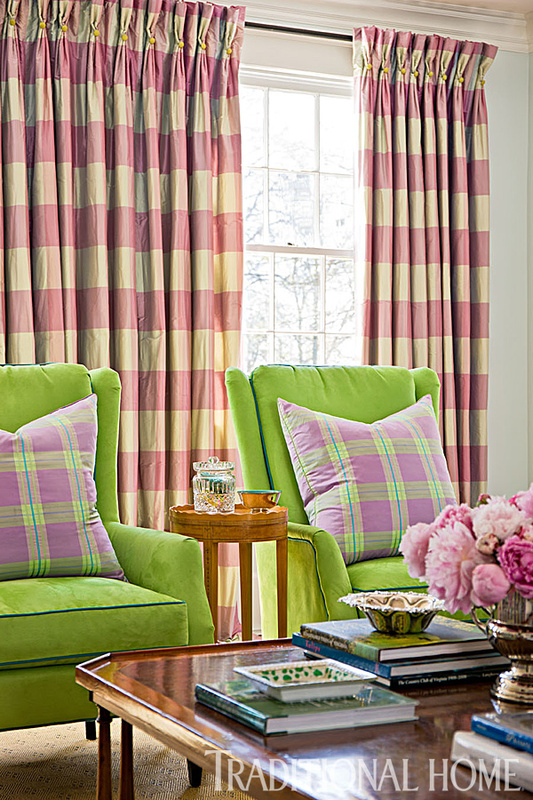 Window-shade fabric (“Country Plains”/Zest): Robert Allen, robertallendesign.com. Elizabeth Siegel, left, “wears the colors of her home—they’re her favorites,” says her interior designer, Shazalynn Cavin-Winfrey, right. The ceramic garden stool is from Made Goods. Ceramic garden stool (“Winona Stool”): Made Goods, madegoods.com. Check out the colorful renovation of this Capitol Hill home.